Wall Mount House Number Sign with Solar Light - - two-piece solar sign kit consists of a personalized 9" x 6" oval house number sign with a solar bracket extension and solar light. For lawn mounting or hanging options, see our similar signs at right. Fast turnaround; ships in 2-3 days. House number sign holds two, three, or four large numbers or letters. Made in USA. Sturdy and UV-stabilized 1/8" thick laminated acrylic construction with engraved numbers. Overall dimensions: 9"W x 9-1/4"H.
Lights up automatically every night (can also be turned off). Includes plaque, solar light, and four stainless steel screws. Comfort House J0014 (also known as COSSW0906). 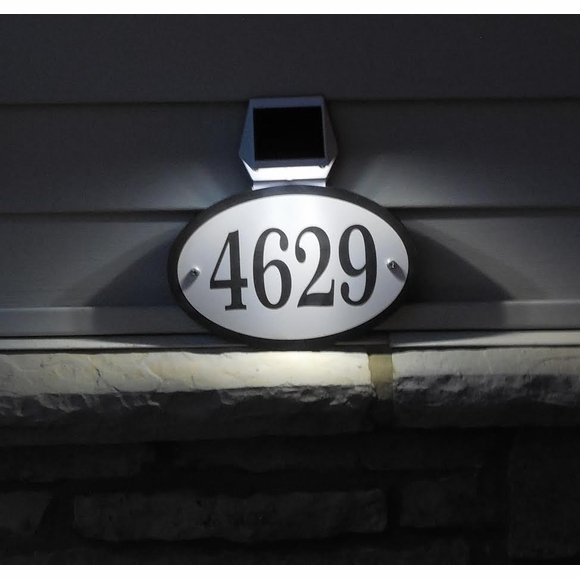 Personalized oval address sign and attached solar bracket extension and solar light sold together as a complete set. Some clients ask for this item by the name Comfort House Solar Address Plaque or Solar 911 Sign. It was easy to install but we forgot to turn the switch inside to activate the solar panel. it can be well seen from the street.